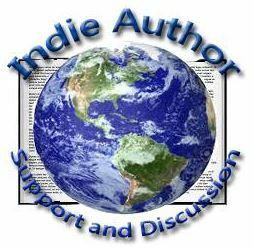 How do you create a positive and visible author platform? How do you bring readers to you instead of having to search them out? Having published, with or without the help of Traditional Publishing, you will need a platform. The book market is saturated and if you publish and sit back waiting for people to find you and your books, you may be waiting interminably. Even traditional publishers require a huge amount of author input and rely on you having a good social media platform to begin with. So where do you start? I began with Facebook. I had a personal account with strong privacy settings, but that won’t inform the world about your books beyond your friends and family. So, you’ll need a Facebook Page. There’s a lot of debate about whether Facebook’s algorithms make Pages worthwhile, but it’s still a good place to start and build up a following. It’s important to note that unless you and your followers/likers interact it’s unlikely your posts will be seen, so make an effort to interact and post regularly. Facebook allows you to add several great functions to your Page. The Call to Action button allows you to add a link to your shop/Amazon, so people can immediately find your product. Add the Author Marketing App so you can add your books either manually or via their ISBN and have easy access to all your books from your Facebook page. Then there’s Twitter. I cut my teeth on Twitter before anything else. I wanted everyone to know about my book so joined Twitter – I will be forever grateful, though, that I never crammed my twitter feed with my books above interacting. There it is again that word – interact – the most important word on social media. Even if you’re only using social media for marketing, you are building relationships first and foremost. Don’t underestimate the value of friends and relationships online. Make sure your Twitter Bio is strong, a brief introduction to you and your audience. Add a link directly to your books or website or blog whichever is your primary source for information and sales. And Twitter is the Queen of Hashtags so use them – in your bio and in your tweets – to help people find you and your content. Don’t be the person who Tweets endlessly about your books and nothing else – and don’t RT endlessly everyone else’s books. People will tire of a stream of book ads and will either turn off your RT’s or unfollow you. Don’t use DM (Direct Messages) unless you are actually contacting someone for a reason, and not to advertise yourself. If you DM me as soon as I follow you with ‘Thanks for following you can find my books (here) and my FB page (here) and please buy my books – because I’m getting desperate…’ then I will unfollow you. Direct Messages are almost sacred and should be used sparingly, as such. By all means when you’re followed tweet the new follower with a welcome message and interact with them, but don’t use DM’s unless you are asking them something that can’t be shared publicly. I will also unfollow those who Tweet ‘I’ve had 26 unfollowers today – I know who you are…’ Nobody cares who follows or unfollows you and if I see you using this app when I check out your feed before following, you’ll have lost me straight away. Some people believe Twitter is all about numbers and how many followers you have. Maybe that works. However, I follow someone because I’m interested in what they might have to say not because I just might, and might is the operative word, sell you something. If I had hundreds of thousands of people to follow I’d never be able to interact and to create friendships and relationships, and for me Twitter gave me friends and a writing community which I adore. Google+ is important, more because its content is indexed and it helps you raise your profile and online rankings. I don’t understand a lot about SEO, but I do know that if someone shares your content on Google+ that post will rank higher and can be found within the hugeness of the web much more easily. I find Google+ difficult to work with, but persevere and benefit from it. Create your Brand Page or personal page in a similar way to Facebook and interact. Your Amazon Author Page is of utmost importance when you’re starting out. It shows up with your books on their sale pages on Amazon and adds dimension and interest. Think about when you search for a book on Amazon – when it comes up you read the blurb and scroll to check out the author. This is their Amazon Author Page. 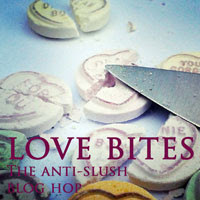 Go to Amazon Author Central (and there are several: .com, .co.uk and other countries) and fill it out. Link up your blog on the .com site and add your author photo and books. People can also follow you and get updates when you release a book. The next few social media sites are more optional, but worth signing up to and using. Of these Pinterest is the most useful and fun. Pinterest is a giant online noticeboard, you can pin pictures and return to them whenever you wish! Each picture should link to an article or blog post from whence the picture came. Many links are broken on Pinterest, but you can utilise Pinterest by adding great pictures to your own blog posts and adding a ‘Pin It’ tag. Make sure any pictures you use are yours to use and don’t fall foul of copyrights. Other useful sites are Flipboard, Stumbleupon, Snapchat and Tumblr. I also love Instagram. Instagram is becoming more useful for marketing as you can post your own ads and personal interest pictures for your followers. Who doesn’t like knowing more about their favourite author’s personal life and what makes them tick or what inspires them? You can share your Instagram pictures on most other social media and spread the love! Blogs are the best way to get your writing out there and to find new readers. I began blogging on Blogspot, posting my Flash Fiction to a number of sites I followed: Five Sentence Fiction, Visual Dare, Mid Week Blues Buster to name but a few. These sites and exercises helped me to hone my writing and my skills and made me a far better writer than I was. Slowly, my own writing took over my time and my flash fiction decreased. I re-evaluated my blog and transferred it to WordPress, a site I find much more writer friendly. I had no idea what to post, but blogging is an important way to keep a presence on the internet and to keep my writing public. Often, we writers sit at home and churn out the words, but until a book is released no one sees us and blogging can keep you in the public eye. I decided to pick a few subjects that I loved and wanted to write about, and that fit well with the books I had or was writing. I chose to write about Nature; Mental and Emotional Health; Positivity and Dreams; and writing and reading. Mixed in would be fun posts about whatever took my fancy and flash fiction! I adore nature, the outdoors and its beauty, and nature inspires my writing a great amount, and it meant I could add my own photographs and pictures of flowers and trees! Mental health and reducing its stigma is personally important and I would be able to share my own issues and helps. 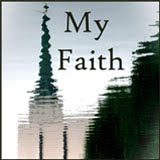 Dreams and fighting for what you believe is another passion of mine, and all three of these subjects are paramount in my ‘Hope Within’ books, so I love writing and sharing about them! It’s up to you what you blog, the most important thing is to choose what you love, what’s important to you, and not to get bogged down. You need to love what you’re writing about. Link back to great sources. Get and be guest bloggers. Use your own photographs and pictures to avoid copyright issues, or find free image sites. Be consistent, in both posting and how you post. Your blog will become part of your brand. Your website is a first stop for most of those searching for you online. They might have seen your business cards, ads, or just heard about you. They need to be able to find you. Your website might be your blog too. Make sure it’s clean, strong, and consistent with your brand. I choose to have a Weebly website and a WordPress blog, both link easily to each other via one click. Be sure they do, like me your blog may be named differently to your personal brand, and it needs to be linked. People may find you via your website or blog, so make sure all your social media are linked on both sites. Links to your other media are imperative. Keep them clean and easy to find. I have several pages on my website: a home page with ads and my author picture; an about page; a book page with links to all my publications; a page of reviews – you can see what readers have thought about my books; a news page; an extras page with downloadables, gallery, fun facts about me, and a few snippets of my flash fiction – try before you buy; and a contact me page with my media kit. I then have direct links to my Blog and Etsy shop! Make your website fun, informative and accessible. Once you’ve decided what platforms are important to you, stick with them. You may start using Pinterest and decided it’s not for you. There are no right or wrong answers. No one will force you to interact on Twitter if you hate Twitter! Many people will tell you they sell enough books purely by blogging, or whichever social media suits them. Many will tell you they can’t sell any books despite having every social media set up they can find. You need to learn what works for you. Unfortunately to sell books, you need to market and unless you have a great deal with a publisher right behind you, that job is going to be yours. Consistency is vital. Use the same author photo across the board on your public platforms. I have a different personal profile pic for my own Facebook, but that’s mine, not my author profile. On the same note, use the same name. I used to call myself LastKrystallos on Twitter, and you’ll still find The Last Krystallos as my blog name, but changing all my social media to Lisa Shambrook means that I’m much more easily searchable and discoverable. Though my blog is still called The Last Krystallos, you will see that my name and author picture are very visible. Intersperse your links to your books/blog posts/ads etc with genuine conversation and interaction especially on Twitter and Facebook. You are a person, not a repetitive bot, let people get to know you. If I like someone I’m 100% more likely to buy their writing than if they bombard me with ads and links. Interact. I hope some of this will be useful to you and will help you create your online presence. who will delight in both your words and in you yourself! Let me know if you have any further platform building tips? This entry was posted in Authors, Blogging, Books, indie Authors, Social Media, Writing and tagged author platform, blogging, blogs, building a following, Facebook, finding readers, Instagram, social media, tips, twitter, websites on 6th April 2016 by Lisa Shambrook. the name you’re going to be known and recognised as? 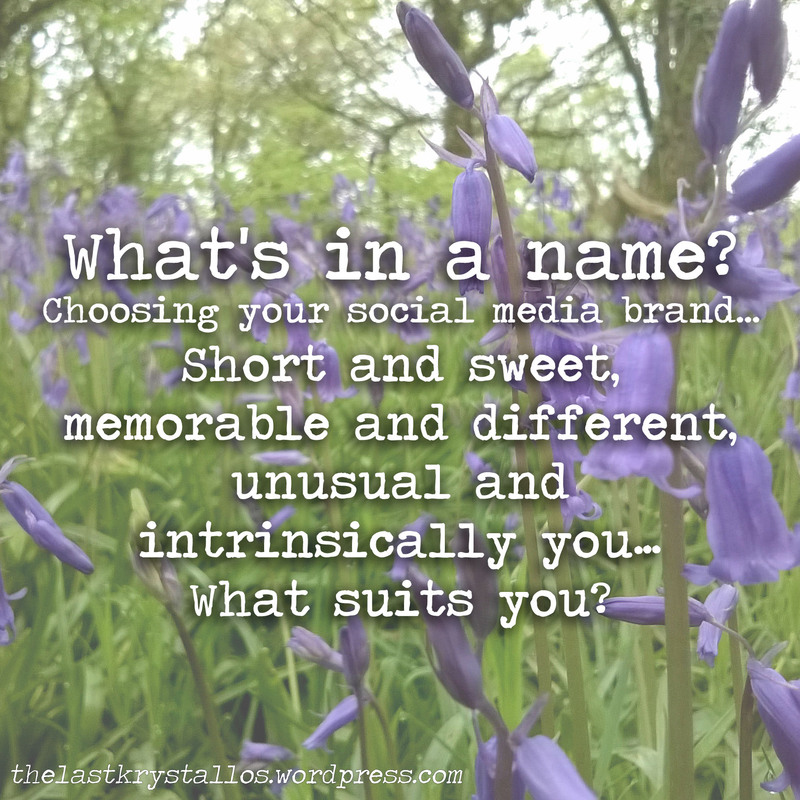 Many new to social media and those looking to brand themselves online wonder where to start when asked to choose a name. For some it will make sense to stick closely to your given name, especially if you’re a writer or your product bears your own name. For others you can introduce a little more fun or intrigue, whichever you prefer! When I first joined Twitter, I was shy and was faced with quickly choosing a name to sign up with. I grabbed my favourite dragon and title of a yet to be finished novel, and became @LastKrystallos. I had no idea how important this name would become to me. When I began writing my series of dragon adventure novels over a decade ago, I researched names to call my dragons. I have several, which I won’t name here, but as my last Krystallos has been out there for a while, I’ll talk about him. 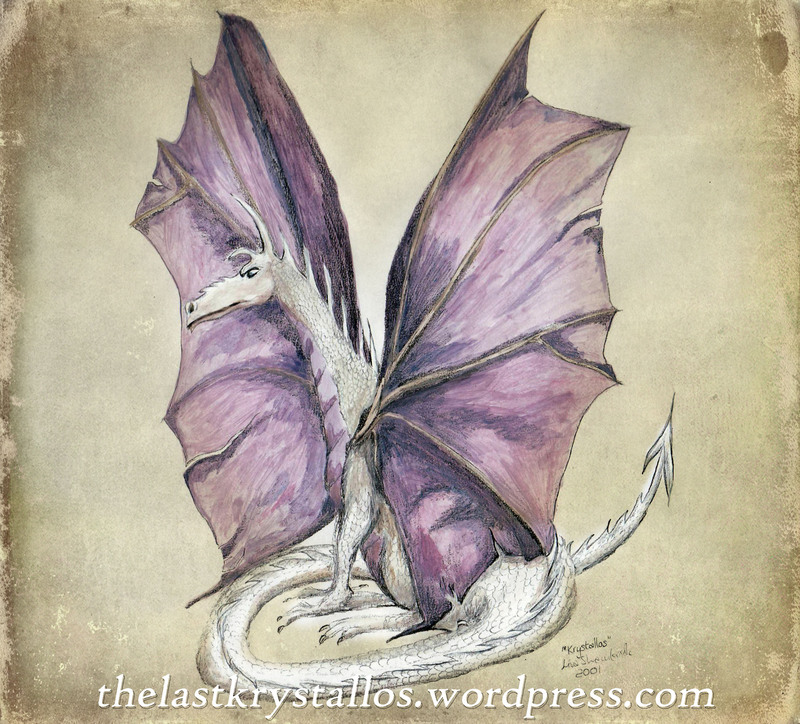 Kryos, my last Krystallos and my social media moniker*, is a dragon that lives within my fantasy tales…he’s been featured in several Flash Fictions: Love, and Memories, and the latter piece placed in a contest. I wanted a name that meant something to me, that would be instantly recognisable and that people would ultimately connect with me. *I joined Twitter back in 2011 and have since become @LastKrystallos on Instagram, I am The Last Krystallos on Flickr and eBay, on my now defunct Blogspot and on WordPress. I comment on Blogger blogs with Last Krystallos, and write flash fiction under it, and many other sites also are familiar with my nickname. I use my own name on Pinterest and Google+. I am also owner of the Last Krystallos Publishing imprint and both myself and my books are linked intrinsically to the name. If you Google ‘Krystallos’ you can find me, and if you search ‘Last Krystallos’, it will be pretty much predominately my sites. I’ve also tagged almost all my online photographs with the name too, so they appear quickly within image search parameters. Now what does this say? Firstly, your name will spread, it will appear across the span of the internet faster than you think and once there, it will remain. Secondly, that your choice is of great importance. If your name is out there, you need to be sure it’s the name you want and are comfortable with. Consistency is very important. My branding of Lisa Shambrook as the Last Krystallos is successful; the two names will always be associated. I am careful that across my social media I use the same names, the same photographs, logos, and images. For instance, this blog has the same background as my website and I use the same author photograph to identify myself. You’ll find different photos on my personal Facebook page, but my Author Page and in general my social media will be easily identifiable as mine. Your social media are an extension of you and recognition is paramount. Also remember, as you progress you will need to periodically update. When you change your professional media photograph remember to change it across your media. Be sure you think about what you want to be known as, it’s going to be very difficult to change once it’s out there. Is it memorable, can people spell it? Choose carefully and research the name you want to use. Don’t choose a name that is already associated with another person or product, or you may drown amid their surge. For instance if someone wanted to brand themselves Krystallos, one Google search would show my social media presence and my association may damage theirs, or vice versa. Also, none of us want to tread on someone else’s feet! Research the meaning of the name you wish to use, be sure it has no derogatory connotations or hidden meanings. Find a name and stick with it, be sure to use it across the board so you can be instantly connected to that signature. Have fun with it, even if you use your own name, you can find an identifiable tag line. Play with ideas, but take your time to choose the right one. Short and sweet, memorable and different, unusual and intrinsically you…what suits you? What are some of the more memorable names out there? Why did you choose the name you have? *EDITED August 2015: I have since decided to change my opinion on Twitter and Instagram particularly. I am now known as @LisaShambrook on Twitter and Instagram. The reasons are to offer more consistent branding and to be more easily discovered. After all, if my books are known by my name, and they are, then that’s what readers will search. I stand by my love and reasons for The Last Krystallos and my blog will remain the same as it is my personal place. However, I do agree that using your own name, especially as an author, will ultimately make your brand stronger and more identifiable. Make it work for you, but keep it easy to find! This entry was posted in Blogging, Social Media, Writing and tagged blogs, choosing a name, Facebook, identification, identifying, names, social media, tags, The Last Krystallos, twitter on 25th March 2015 by Lisa Shambrook. When you grow up losing yourself in books you can’t help but have an affinity to the written word that will last a life time. Amaranth Alchemy’s brand of creativity involves rescuing old, unwanted and damaged books breathing new life into their pages. My daughter, Bekah, and I recently embarked on a new adventure and created Amaranth Alchemy and we’d love to introduce you to our work! Both of us spent our childhoods engrossed within the adventures laid down on pages; words that took us away and threw us into other worlds, other lives and allowed us to escape and experience so much more than our own small worlds could let us! I was the proverbial bookworm, never happier than when I was curled up with a good book. I loved searching my local independent bookstore for second hand books I could spend my pocket money on. The shop owner helpfully rescued tattered copies of The Famous Five and each of The Silver Brumby books so I could immerse myself amongst my favourite things! My book collection grew and I was always saddened when my beloved books began to fall apart, spine glue disintegrating, pages slipping out, accidents, a book left out in the rain, pages torn, and general wearing out. I kept a lot of my books, reluctant to release them, and unable to throw them away, despite having bought a better condition copy! Over the years my old books vanished to charity, or final acceptance of the dreaded bin, sacrilegious! These days charity shops are overrun with books, too many to sell or recycle and many are pulped. Those that don’t make charity are often thrown away to rot in landfill. Bekah and I decided to do something about these lost and abandoned books and created a rescue service! Amaranth: a purple flower whose name derives from the Greek ἀμάραντος (amarantos) which means ‘unfading’ and is what books are, unfading stories, and Alchemy: a magical process of creation, turning old books into new. 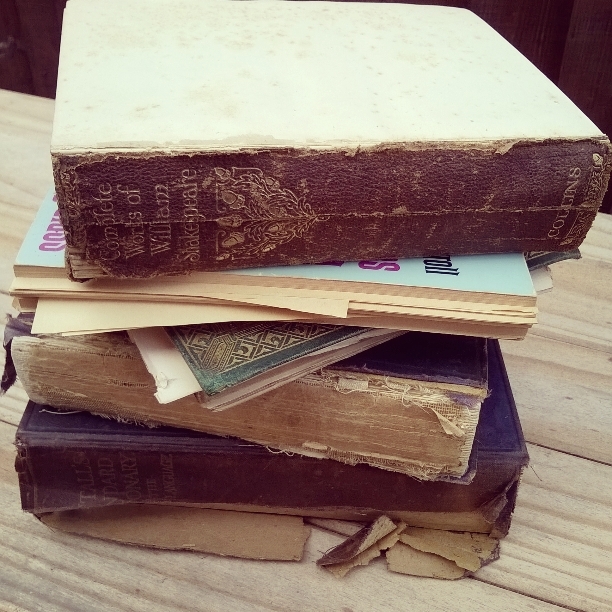 The vintage book pages we use in our craft are currently sourced from the Healthy Planet (a charity that gives away donated books preventing them going to landfill or being pulped) or from books lost within the dusty back rooms of charity shops or donated to us. Each item we make breathes new life into old pages. We promise never to take pages from new books unless they are irrevocably damaged! GIVEWAY: you can own Mrs Tiggy Winkle! Go to our FB page to take part! You can have a chance to win the necklace above! It’s our very first giveaway and all you need to do is pop over to Facebook and ‘like’ our page Amaranth Alchemy, like and comment on the Giveaway photo…very easy and Mrs Tiggy Winkle is waiting for a lovely new home…could it be yours? Even if you don’t win…you can have 15% off in our Etsy shop until the 15th October 2014...use the code above when you go through to pay for your purchases. 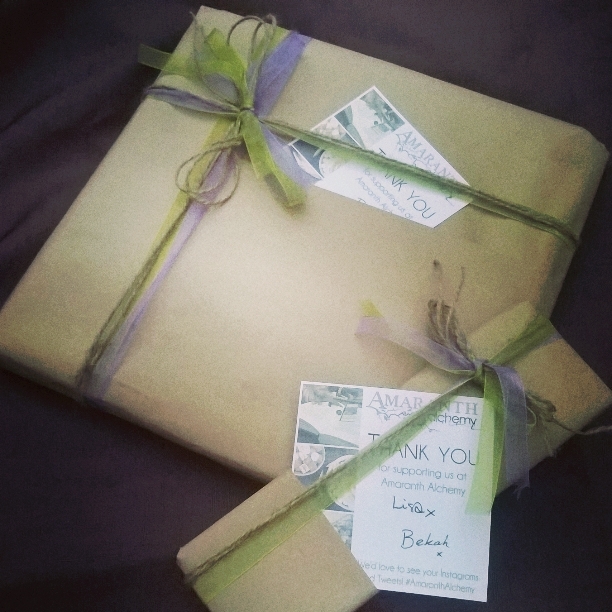 Go and take a look and end up with a beautiful package delivered to your door! Amaranth Alchemy is a mother and daughter team who adore words and art of every kind. Lisa is an author, photographer and an all-round artsy dreamer. Her first novel ‘Beneath the Rainbow’ is available to critical acclaim. When she’s not writing her second and third novels she can be found tinkering with other arty projects. Bekah is an artist and designer by trade, spending time as a Make-Up Artist out on photo shoots, and designing websites, logos and all manner of arty things. She can be discovered at Masterpiece Artistry. Lisa and Bekah have an eye for all things of natural beauty and a talent for putting creative arts together. This entry was posted in Amaranth Alchemy, Art, Books, DIY and Craft and tagged abandoned, Amaranth Alchemy, art, book pages, boooks, craft, damaged, etsy, Facebook, Lost, new life, old, old pages, pages, vintage on 23rd September 2014 by Lisa Shambrook.